to learn about Sepsis and Blood Gas and Electrolyte Testing. Cindy Graves from Gettysburg Hospital welcomed attendees to the meeting and held a brief business meeting. 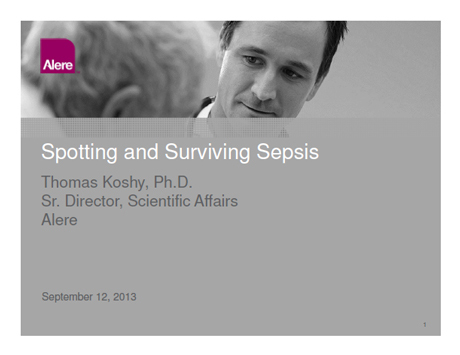 Thomas Koshy, PhD, Senior Director of Scientific Affairs for Alere, then presented 'Spotting and Surviving Sepsis'. 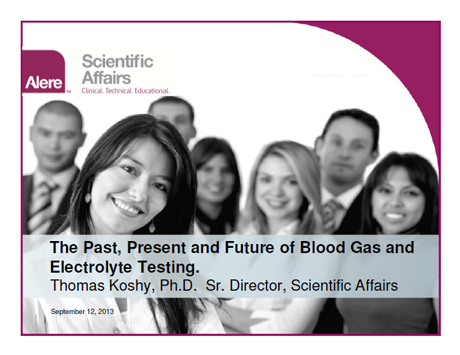 After a break, Dr. Koshy delivered a presentation on the Past, Present and Future of Blood Gas and Electrolyte Testing'. For a copy of either of Dr. Koshy's presentations, click on one of the images below. During the break, attendees took time to visit the many vendors who participated in the meeting's vendor fair. A luncheon and more time with vendors followed. The 2013 recipients of the The Wendy VanDyke Memorial Grant and The Bill Sweger Memorial Grant were also announced. These grants are based upon specific standards established by the committee and are open to any individual seeking education as a clinical scientist. Click here to register for our "Practical Tips for Point of Care Testing", presetned by Jim Nichols, Ph.D., DABCC, FACB, on Wednesday, December 11, 2013 12:00 PM Eastern.